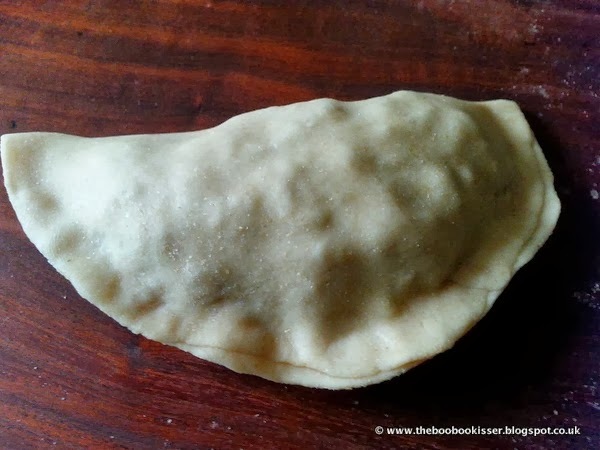 Kadabus are essentially half-moon shaped dumplings. 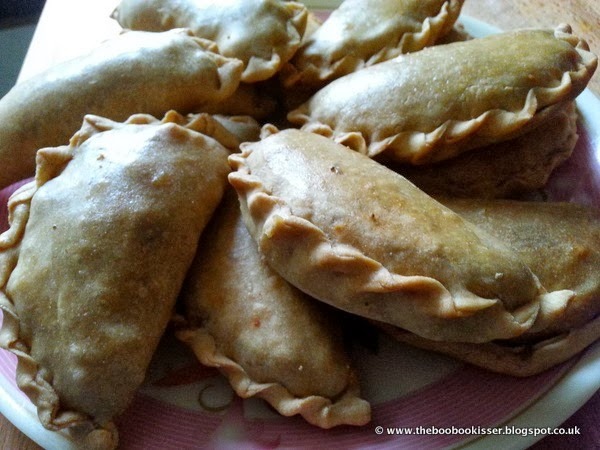 They can be sweet or savoury, and are traditionally either deep fried or steamed. 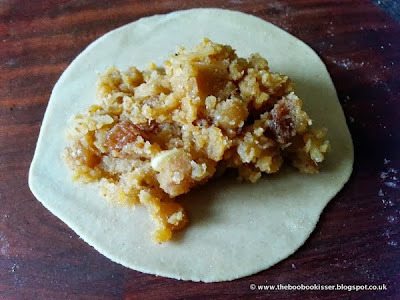 In my new avatar as a domestic goddess, I decided to make some sweet kadabus with a chana dal (split chickpeas) and jaggery (unrefined cane sugar) stuffing. With a twist. I decided to bake them in an oven, a bit of fusion cooking. I must say the entire credit for this recipe goes to my Aai (Mother). It was she who gave me the proportions for all the ingredients and suggested I try baking the kadabus. Pressure cook the soaked chana dal till it is thoroughly cooked. Drain any excess water from the dal, transfer it to a saucepan, and set it to thicken on the hob on a medium heat. Add the jaggery to the dal and let it melt. Stir intermittently. Once all the jaggery has melted and the puran starts to thicken, use a spoon to coarsely mash up the chana dal. Take care as the puran thickens; it will splutter. Reduce the heat to minimise spluttering. It does take a while to get the puran to the spluttering stage. It helps to be patient. In a frying pan, dry roast the poppy seeds and the shredded coconut. Add these dry roasted things to the chana dal mix. Stir in to ensure everything is uniformly mixed. Now add all the chopped dried fruit to the puran, along with the sugar. Mix everything together. The sugar speeds up the thickening process. So things will move rather quickly from here on. Once the puran is sufficiently thickened, enough to hold a spoon vertically, add the nutmeg and the saffron. Continue on a low heat for another minute or so, just enough to allow the spices to infuse into the puran. Remove from the heat and stir in the cardamom. I think cooking destroys the flavour of cardamom. So I always add it in the end, after the pan comes off the heat. Let the puran cool down before you use it to stuff the kadabus. 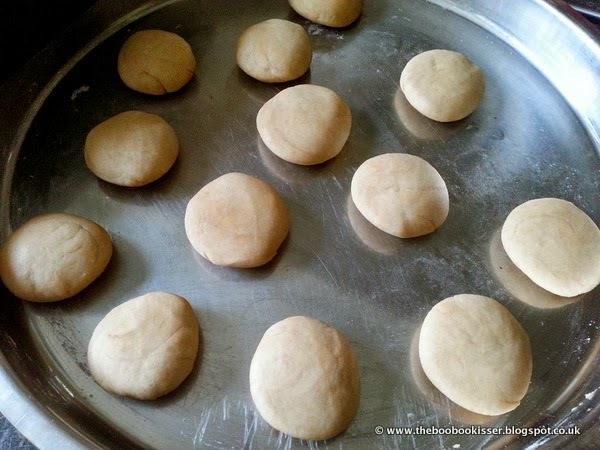 To make the dough for the kadabu covers, add two tablespoonfuls of oil to the flour. Add water, a little at a time, while you knead the dough. The dough has to be of a fairly firm consistency. 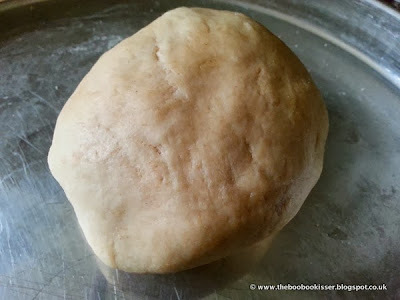 Once kneaded, let it rest for at least an hour before you start making the kadabus. Divide the rested dough into small balls of equal size. Use a rolling pin to roll out each ball into a flat circle. Go as thin as is safely possible, especially along the edges. Just make sure the dough does not tear. Use some flour to dust the dough; this will stop it sticking. 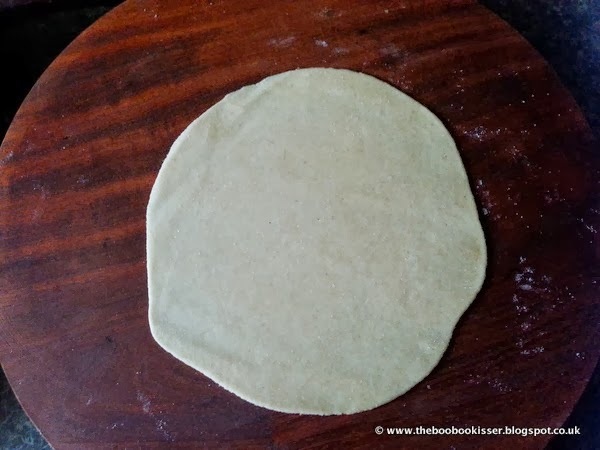 Spoon out a generous amount of puran into the middle of the rolled-out dough circle. Use your fingers if you must to pat it into shape and keep it from spilling out. But don't scrimp on the stuffing. 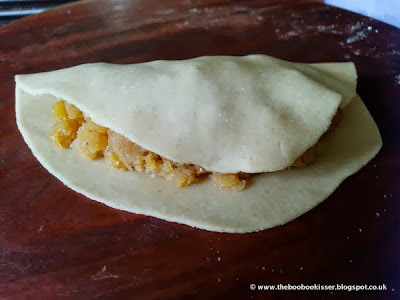 Gently fold over one edge of the circle over the puran stuffing. It should look something like a taco. Stick the two edges together. At this stage, it may help to gently lift the dumpling onto the palm of your hand, so you can manipulate the filling and stick the edges. 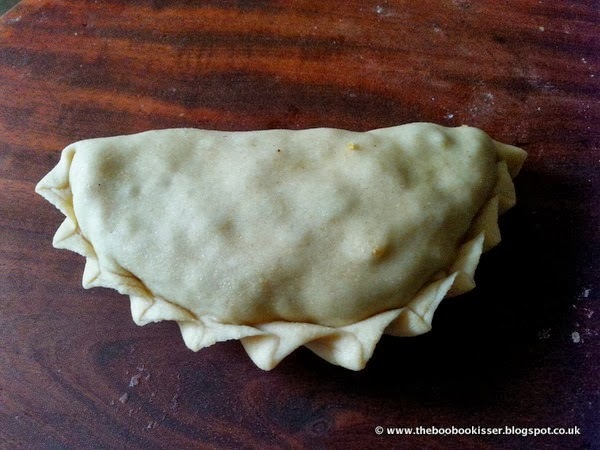 Gently fold the stuck edges in a frilly pattern to make the dumpling look pretty. Don't worry if you cannot do this. The kadabus will taste just as nice with the edges just stuck together. Place the prepared kadabus on a lined and greased baking sheet or tray. Brush the tops with a little milk. Bake for about an hour on the middle shelf of a pre-heated oven at 160 degrees celsius (for a fan-assisted oven), or till the cases turn golden brown. You may want to re-apply a little milk to the tops half way through the baking. 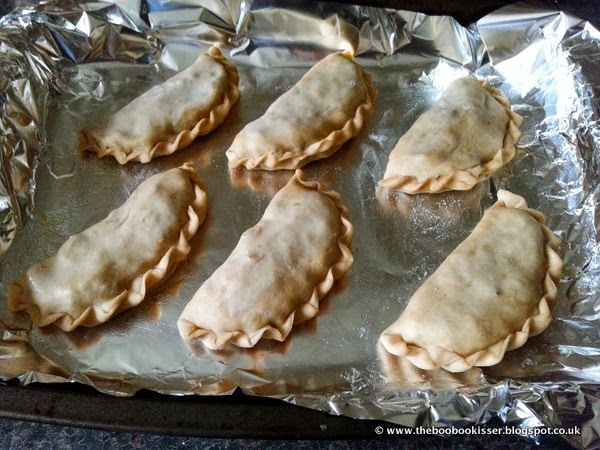 Allow them to cool for a bit before you tuck in; the insides will be very, very hot. Your baked puran kadabus are ready to be served, with a dollop of ghee if you so please. 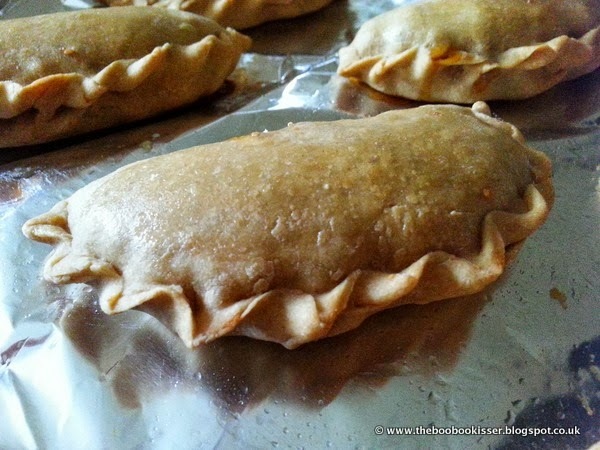 Sounds delicious and looks very much like Russian pirozhki. I just made the batch the other day, but haven't done the post yet. Ooh, didn't know about pirozhki, Galina. Would love to read your post about it.